PokerStars is a true industry pioneer that has managed to create one of the largest online poker communities. We were tempted ourselves by their polished platform, so we decided to test them out and make this PokerStars review. In it, we will try to summarize everything this one poker website managed to build in almost two decades. This includes their abundant game selection that is full of different titles – including one they developed on their own, that’s slowly becoming one of the most popular games in the online community. The website also offers loads of bonuses that prove to be highly useful when you need an extra edge. In addition, everything, their tight security covers everything and their highly professional customer support is always there whenever you need it. The website began its history in 2001 in the US. In 2005, PokerStars moved to the UK, where they continued growing their online presence. The website is under the ownership of Rational Intellectual Holdings Limited and operates under the Isle of Man Gambling Supervision Commission’s licence. PokerStars has been a leader of innovation when it comes to online poker. They were the first website to organize cash multi-table online poker tournaments. They were also the starting ground for many WSOP qualifiers, so we can safely say, PokerStars has been on the very forefront of online poker and is definitely one of the best poker sites out there. To begin your journey at PokerStars UK, you’ll have to download their desktop software. The downloadable installer is around 2 MB, and the installation takes a couple of minutes. Once it’s done, you can access the lobby. In it, you’ll find a wide array of poker games, including Hold’Em, Omaha, Courchevel, Stud, Razz, Draw, Horse and Badugi, almost all with their respective Hi-Lo variations. Players can choose between various tables such as Sit & Go, Cash, Zoom and KO. You can also access the various Tournaments and Special Events and the all-new Power Up game – the most interesting innovation we came across while making this PokerStars review must be their housemade Power Up game. Power Up is a PokerStars exclusive game that seamlessly blends online gaming, 3D graphics and poker into one experience. The game plays itself in a classic Hold’Em manner, but with a cyber-espionage twist. PokerStars introduces Power Up cards, which each player gets and can use in every turn. There are 10 of these in total, and each of them gains you a distinct ability, such as Disintegrate, which lets you remove the next card in the deck, or Intel, which shows you the next card in the deck. Now although these cards might seem overpowered, the PokerStars UK team has made sure that all the Power Up cards are well balanced so that no one can get the upper hand. You can anull every Power Up card by using another Power Up card, and most of them only last for one hand. Some of them, like Scanner, lose their advantage the further along the game is. So it’s vital you make adequate strategies while playing Power Up. In addition, Power Up makes for a more exciting nerve battle while at the same time diminishing the luck factor. This makes it the perfect strategy poker game. PokerStars offers more than a hundred different tournaments, including Progressive KOs, Ante Ups and Time Tourneys. You can choose the type of game, speed and buy-in, with freeroll tournaments being available each day. The buy-ins, except for freeroll, can go as low as 10 cents and well over to $5,000 USD. 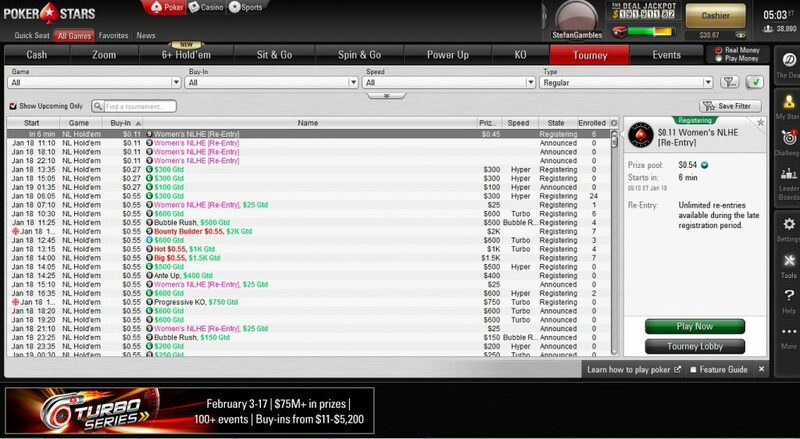 PokerStars has a well-organized and comprehensive rake system. They don’t charge any rake if the hand ends on the first betting round. They calculate their rake percentage as a true percentage using the ‘round half to even’ method of rounding. Now, since we played and reviewed a fair share of poker sites before this PokerStars review, we can safely say with all authority that PokerStars has one of the lowest rakes in the industry. For example, a game with stakes from $0.01 to $0.02 can have a 3.5% rake that caps at $0.30. The rake for a $3–$6 stake game rises to 5%, with a cap going from $1.50 to $3.50. However, the rake never exceeds a $5 cap, even with high stakes tables such as Fixed Limit or Fusion. For more detailed info, make sure to visit their Rake Info page, where they have calculation tables available. Right from the start, you’re greeted with an amazing promo. PokerStars offers a 100% bonus up to $600. You can activate the bonus in three different stages, which you complete by making three qualifying deposits in 60 days. Once you deposit, you have to earn redemption points by playing real money games. You get 5 points per $1 rake, and every time you earn 180 points you can redeem it in $10 cash. With four months as the promo period, you have more than enough time to release all $600. If you wish to claim it, just enter the PokerStars bonus code ‘STARS600’ when depositing. The Spin & Go first deposit bonus is another great chance to start big. If you decide to deposit $20 or more, you can get $30 in extra free play for Spin & Go contests. The rest of your bonus unravels during a six-day period. In the first three days, you will get 5 x $1 Spin & Go tickets that can each get you a top prize of $10,000. In the last three days, you will receive 5 more Spin & Go tickets and 2 x $5 cash bonuses to use in any game you like. All you need to do is enter the PokerStars bonus code ‘THIRTY’ when depositing, and the bonus will be activated instantly. If you wish to take your poker experience with you, PokerStars offers available platforms for iOS and Android devices. The apps are pretty much a perfect substitute for the desktop client. All the features, game types, and even tournaments are there. You can also deposit and withdraw using the Mobile Cashier service. The apps works perfectly on any screen ratio, so the iOS app will work great both on iPhones and iPads. You can download the PokerStars app from Google Play and iTunes. PokerStars offers banking with fourteen different payment methods, including Visa, Maestro, Mastercard, PayPal, Skrill, Neteller, Paysafecard, Much Better, Bank Transfer, NeoSurf, Wire Transfer and Rapid. The minimum deposit is $10, and there is no minimum withdrawal amount. Note that you can change your display currency into euros, British pounds or Canadian dollars in the Settings tab to keep better track of your funds. PokerStars has one of the most comprehensive security pages we’ve seen. From the first moment you visit the PokerStars page and login, all your information is stored under encryption. Furthermore, the website segregates player’s funds, as requested by British law. The website also requires players to verify their accounts with an ID in order to make your account more secure. As for fairness, every shuffle depends on the Random Number Generator provided by TSG Interactive Services Ltd. Their RNG is under the watchful eye of Gaming Laboratories International, an industry veteran that bases their testing software on multiple ISO standards and works together with governments worldwide to provide a fair gambling environment. If at any point you encounter problems while playing on their platform, you can contact their customer support team. They have a dedicated email form and a live chat support team. We tested their live chat support with a few general questions. They responded in a couple of seconds providing a clear and knowledgeable answer. The website is clearly a product of passion, dedication, and a great deal of experience. Every player can enjoy a wide variety of different games, with some of them like Power Up being right there at the forefront of innovation. You can also build up your balance with an abundance of enticing bonuses. If that’s not enough, the website is host to one of the biggest online communities, which makes all the challenges that much more rewarding.